VANCOUVER ISLAND, BC, CANADA: I have heard so much about this island in British Columbia, Canada for the past many years. Most of my friends in Portland have already been here at least once and I’ve seen some really wonderful pictures from their visits. It was time for us to go and check it out ourselves. 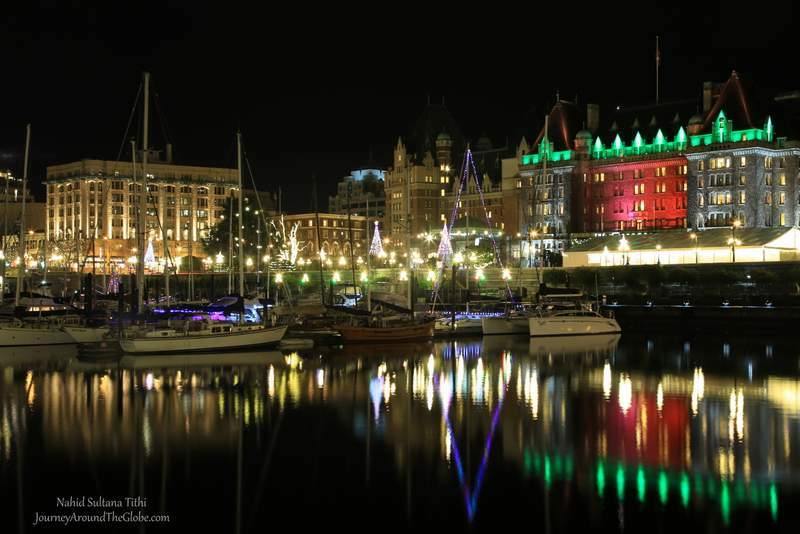 Victoria is a perfect place to visit any time of the year..summer or winter. Though most people probably enjoy the summer there, we were in winter to see the holiday lighting and avoid the crowd at the same time. It’s also a place which kids enjoy as much as adults do. There are plenty of things to do and to see for kids, like Bug Zoo, Butterfly Garden, Miniature World, boat rides, horse rides, and etc. I want to go back to Victoria one summer just to get a feel of its hustles and bustles. TIME of TRAVEL: We drove to Victoria during the winter break of 2014 when my uncle-in-law from Chicago was visiting us in Portland. We first drove to Port Angeles, Washington, stayed there one night, and took an hour and half ferry the next day to Victoria. Having the water all around, Victoria can be very cold in December. We didn’t get any snow or rain (lucky us), but it’s not very unusual to get bad weathers during this time of the year. OUR HOTEL: Huntingdon Manor, only couple minutes of walk from Victoria Harbor and ferry terminal, was our hotel. It was a grand place to stay in for our vacation here and we got a good deal for being there during the off-peak season. The customer service was superb and the rooms were excellent. We had Wi-Fi, continental breakfast, and car parking free of charge. This is no doubt one of the best hotels in Victoria. 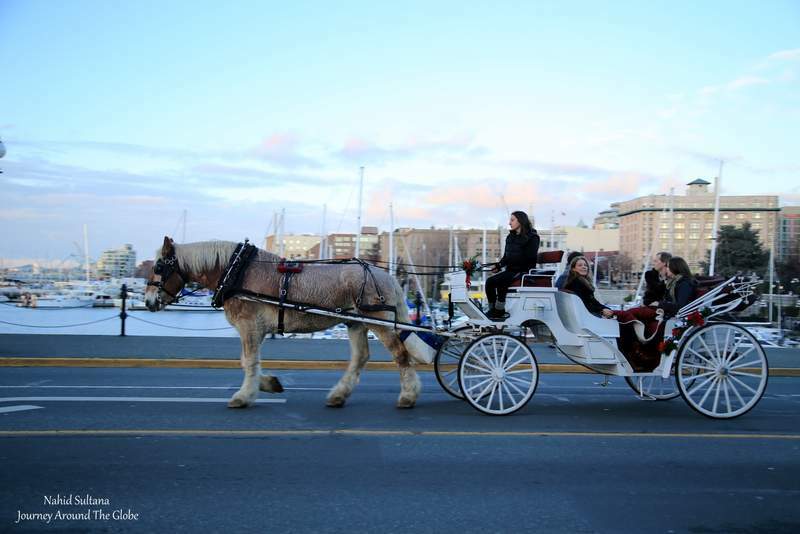 It was only 5 minutes of walk to the Parliament or BC Royal Museum or the main harbor attractions. EATING and SHOPPING: Finding restaurants during Christmas Eve and the Christmas day was a bit worrisome job in Victoria. We had lots of fast-foods for lunch but or dinner, we had Thai, Chinese in Chinatown, and Indian cuisines. We also had dinner at The Old Spaghetti Factory. We tried lunch at Dog-Gone-It which was by the harbor where you can get variety of hotdogs with variety of sauces and toppings…the best hotdog place I’ve tried so far. For shopping, we personally bought a wooden totem-pole and a box of Canadian maple Ceylon tea. I have been addicted to this tea since the day I’ve tried it for its sweet aroma and taste. There are plenty of souvenir shops around the harbor and you will find shops with most of the tourists’ attractions. 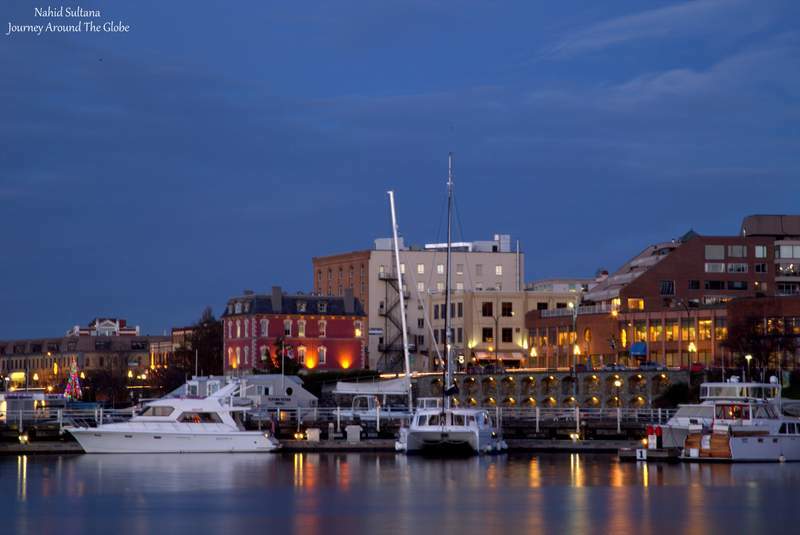 PLACES WE’VE VISITED: We stayed 5 nights in Victoria and we weren’t in a rush to tick-off our must-see spots. We leisurely took time and slowly got around the island to explore its corners. It was nice that we had ample time to learn, enjoy, relax, and make memories. Fort Rodd Hill and Fisgard Lighthouse is a historic landmark in Victoria where we drove the day before Christmas but couldn’t go in because it closed at 2pm…definitely a place to check out here. If you are here in summer, try taking an adventurous whale-watching and eco-marine tour, or a spectacular harbor cruise. They leave from the harbor and with a very reasonable price tourists can enjoy a full or half day tours around the island for something different. 1) VICTORIA HARBOR: The first day, after we got off the ferry, we checked in at our hotel and we barely had some sunlight left to see this land. We quickly rushed out of the hotel to walk by the harbor and then to have dinner and come back to our rooms for some rest. This busy harbor is the heart of this island and the most romantic place to hang out day or night. Watch float planes descend and taxing to their moorings, ferries, boat tours, charter motors through, and the occasional canoe or kayak bravely floating through the traffic. The liveliness of the harbor expands into the land…this is where you will find luxurious hotels like Empress Hotels, mouth-watering restaurants, main tourist attractions, good museums, shops, and strolling areas. 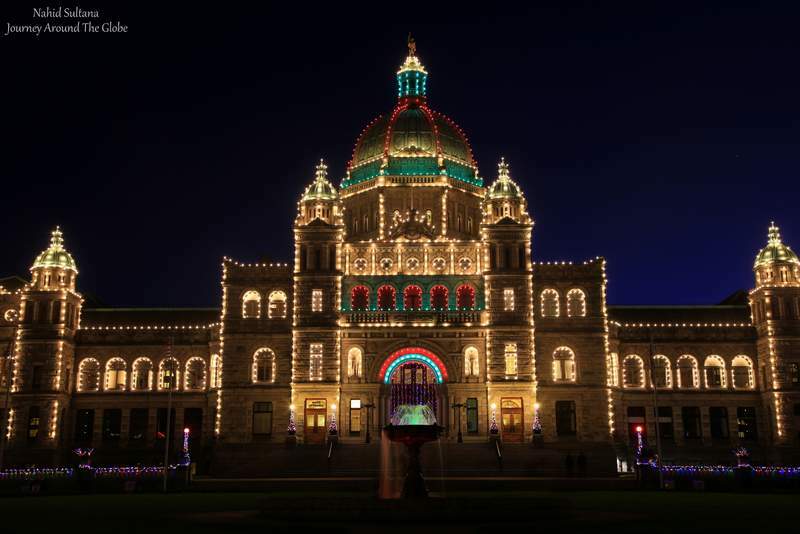 2) BRITISH COLUMBIA PROVINCIAL PARLIAMENT: The next day (Christmas Eve) we started walking towards the harbor again and stopped in front of the Parliament to enjoy its magnificent exterior. From the guard, we found out that we could actually go in that day and take a tour inside the building for free. 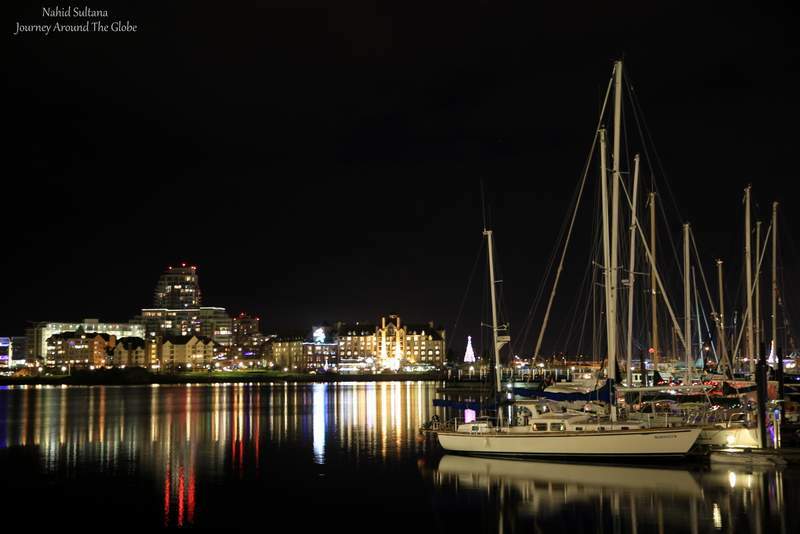 Situated in downtown Victoria, British Columbia’s grand buildings overlook the busy waters of the Inner Harbor. Its majestic architectural splendor offer a sense of rich tradition of this island. The Parliament buildings were designed in 1893. And finally it was open in 1898 in the heart of B.C.’s capital city, Victoria. It is this place where elected representatives, Members of the Legislative Assembly (MLAs) meet to debate and to pass laws that govern British Columbia. Visitors are welcome in the public galleries of the Legislative Chamber whenever the House is sitting. The halls of Parliament Buildings are lined by more than 100 beautiful leaded and stained glass windows, some of them dating back to 1898. These windows celebrate a variety of themes, like quotes from famous writers and philosophers, tribute to the arts and sciences, emblems of Canada’s earliest provinces, and many more. One of the largest and most beautiful windows is the Diamond Jubilee Window, which was created to celebrate the 60th year of the reign of British Queen Elizabeth. 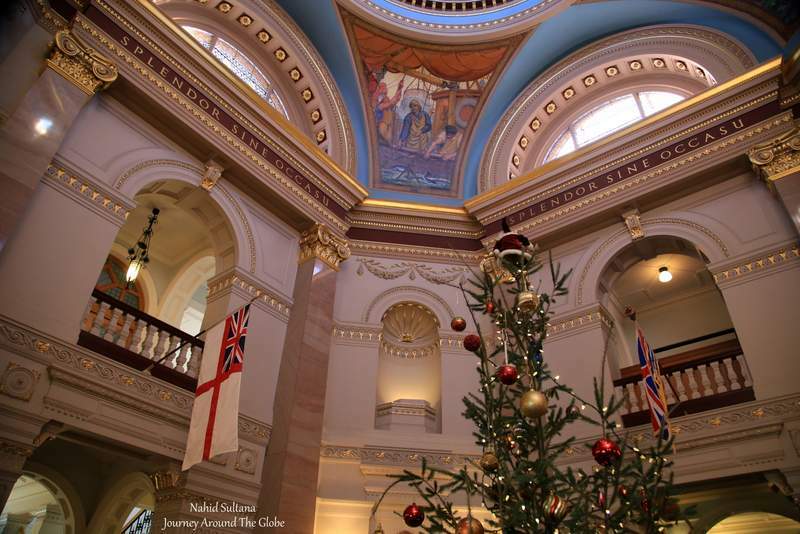 During our visit the majestic main building of the Parliament was decorated with the biggest Christmas tree in Victoria. Exterior of the building looks even more festive at night with all the red, green, and yellow lights. Check out the grand ceilings, mosaic floors, and arch doors in each section. Visit upstairs room, especially Legislative Library. Free tours of the parliament building are available Monday through Friday throughout the whole year, and seven days a week in the summer months. Self-guided tour, which we did, is also permitted. 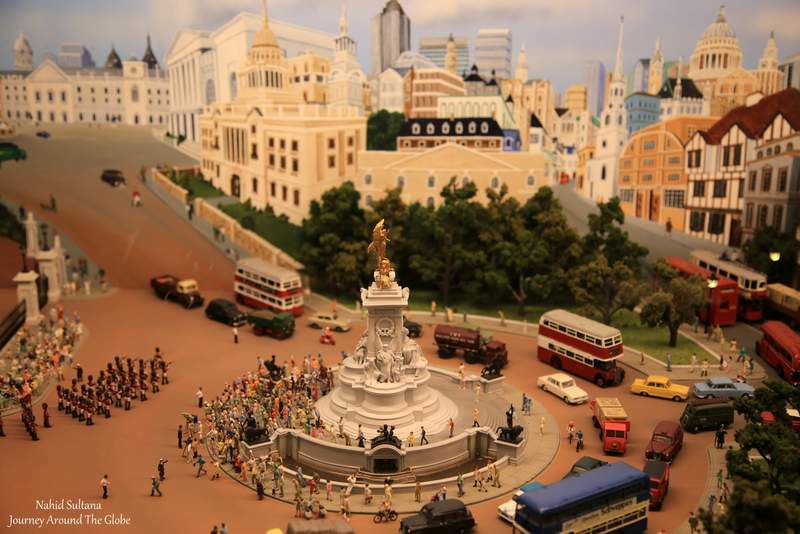 3) MINIATURE WORLD: After some royal and historic time at the Parliament, we strolled along the harbor, passed gorgeous hotels, shops, and big streets, we arrived at the Miniature World. My girls were really excited about this place and it indeed fully satisfied their hunger to see some miniature version of the past and present of the real world. 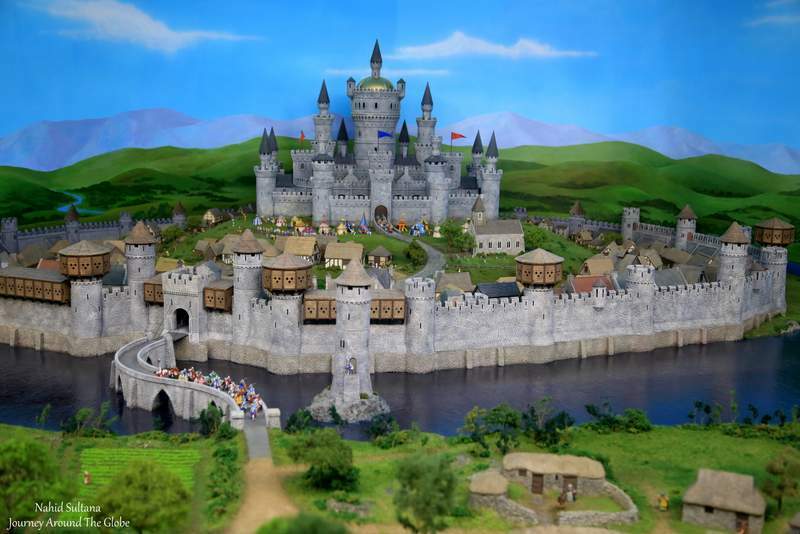 Miniature World in Victoria is one of the greatest little shows in North America. Visit the smallest operational sawmill, view World of Dollhouses, the world’s longest model railroad, World of the Circus, enchanted Valley of Castles, Buckingham Palace, fantasy land, Fields of Glory, King Arthur’s Camelot, classic car rally, Great Canadian Railway, Gulliver’s Travel, old London town from 1670 plus many more tiny treasures and little pleasures. 4) IMAX at ROYAL BC MUSEUM: Opposite of the Miniature World is the Victoria Bug Zoo which was another exciting thing for my kids. But unfortunately it was closed for that day and we had to come back another time to visit. So what to do next? We slowly started walking back to the harbor and saw BC Royal Museum. We wanted to take a day and visit Royal BC Museum but we didn’t have enough time to cover the whole museum that day. While we were thinking about what to do next, IMAX and its feature presentations caught our eyes. We first took a breathtaking IMAX adventure thru “Journey to the South Pacific” on the Christmas Eve. Then we came back here the next day for another stunning tour of “Jerusalem”. FYI, this is the biggest IMAX screen in British Columbia. 5) BEACON HILL PARK: We started our third day (Christmas day) in Victoria with Beacon Hill Park. It was a gray winter morning when we arrived here. But this lush green park in the middle of the busy island is real good spot for the nature lovers. 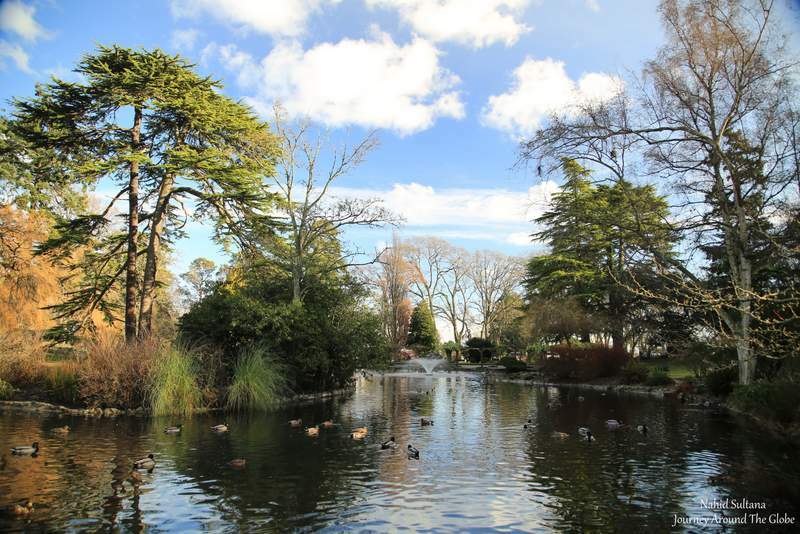 You can find small ponds, hiking trails, cage-free peacocks, and a harmonious atmosphere in this park. On the other side of the park is the oceanfront which is also a great place for strolling or enjoying a late afternoon with your loved ones. 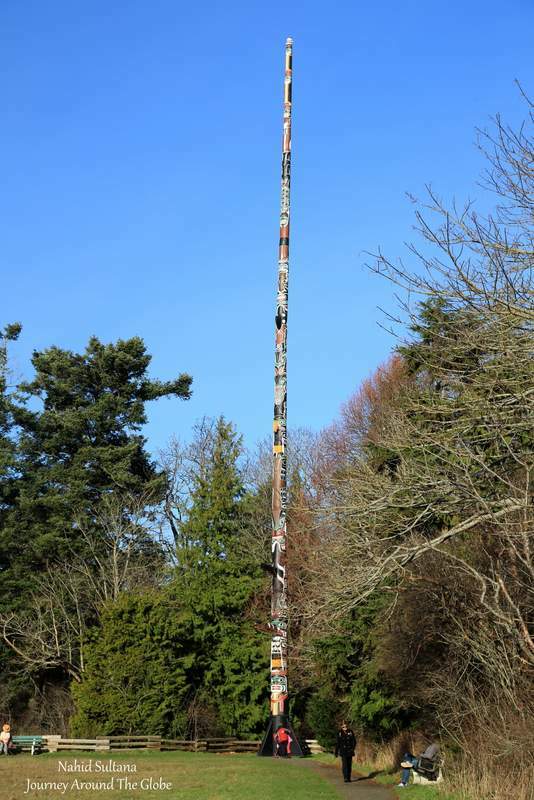 Look out for the totem-pole opposite of one side of waterfront…it’s the tallest one in the world with the size of 127 ft. and 7 inches. 6) BUTCHART GARDEN: Butchart Garden is one of the most visited spots in Victoria and another National Historic Site of Canada. The garden had magical lighting and holiday decorations everywhere. There was also a venue for ice skating where skate rentals were available too. “The Magic of Christmas” started at the beginning of December this year. Thousands of colored lights combine with magnificent decorations to celebrate the festive season. We reached there right before it started to get dark. 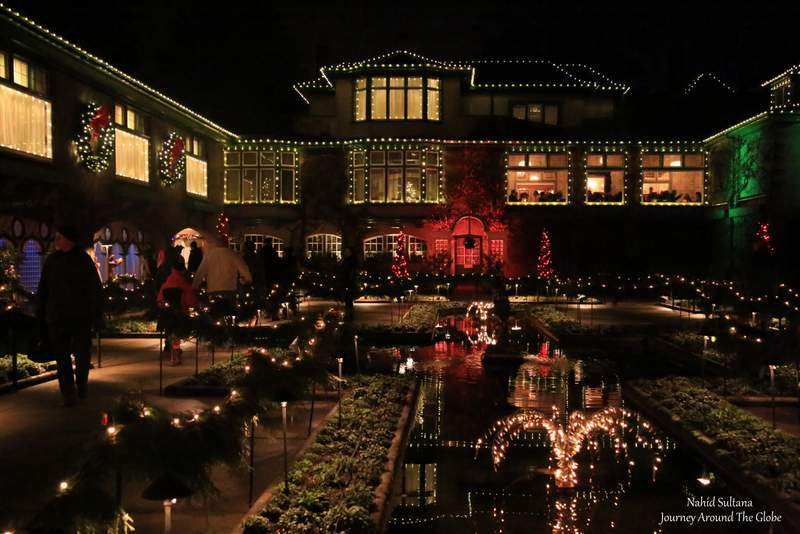 It was a fantastic timing because we could enjoy the lighting, music, and holiday charms all around the garden. 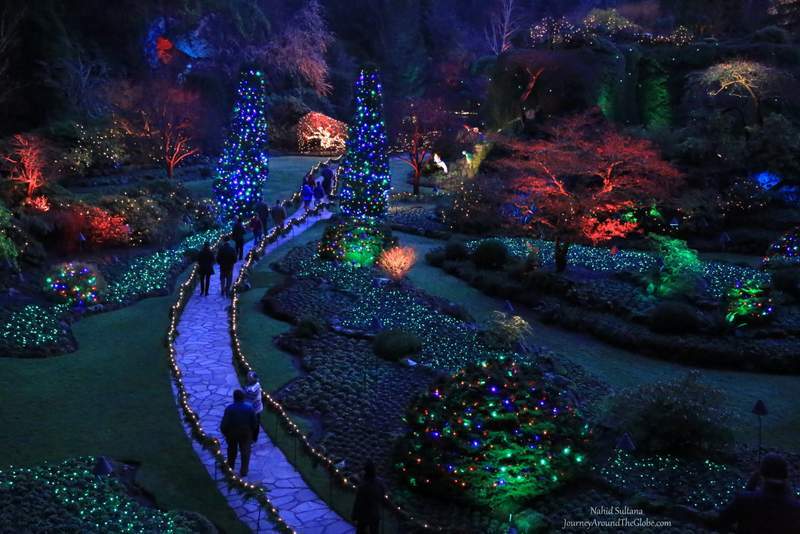 Butchart Garden truly came alive with the colors and scenes of Christmas and holidays. We only saw the winter beauty of this garden, but Butchart Garden is open every day of the year with its 55 acres of vast landscape. I have to come back again here in summer or spring to see hundreds of thousands of lowering bulbs, shrubs, and trees. Even in winter this place was one of the most photogenic spots of this island. The garden celebrated its 100th anniversary in 2004. This is the famous spot and attracts close to a million visitors each year. You will find coffee shop, restaurants, and a gift shop inside the complex. 7) VICTORIA BUG ZOO: This was another place our girls loved. Opposite of the Miniature World, it’s an amazing world of insects and arachnids and they are all ALIVE. 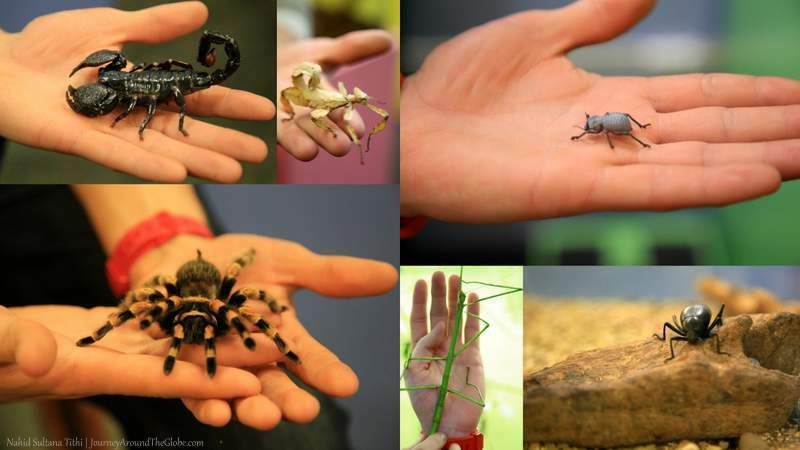 You can experience multi-legged creatures from different parts of the world in a safe and friendly atmosphere. Just to name some, we got up-close and personal with giant walking-sticks, beetle-fish, tarantulas, glow-in-the-dark scorpions, and many more. It has collections of over 60 fascinating species, including Canada’s largest ant farm. Our bug-guide entertained us with all the exotic secrets about creatures of this kingdom and provided lots of hands-on fun experience. It was an interactive and educational adventure for our whole family. 8) BUTTERFLY GARDEN: Butterfly Garden of Victoria is a little heaven for little kids and adults. Visitors can enjoy fluttering by butterflies in their natural habitat in this garden. 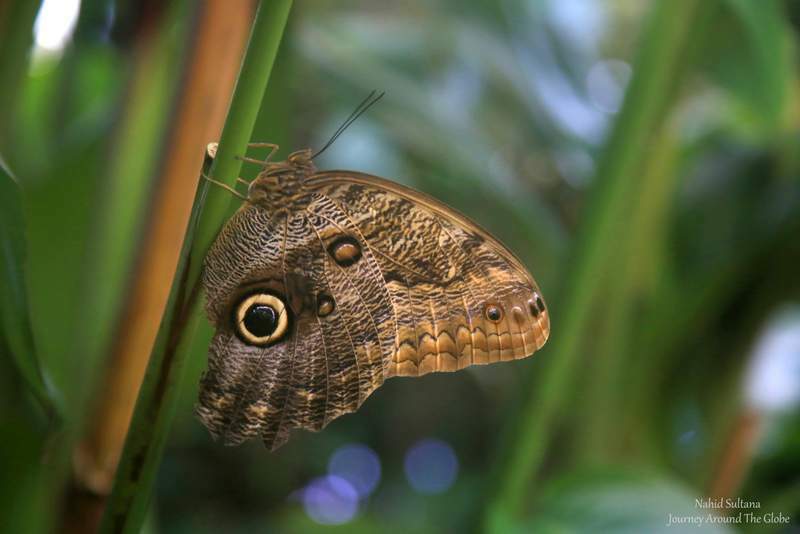 We could see some beautiful blue morpho butterflies very closely along with many other kinds of butterflies and moths. Other than these you can also see some tropical birds, flamingos, and other small water animals. The garden is a very humid inside where tropical plants and bushes can grow without any hesitation too. One thing I have to say about this place is that you may not be able to use your camera. I was so excited about capturing some beautiful shots of colorful butterflies and plants. But as soon as we entered the garden (which is very humid) my camera started to fog up. There is a blower to de-fog your camera but it look really LONG time to clear up, even then I couldn’t use it properly. I had to turn to my iPhone to take some pictures. So, yeh…just something to keep in mind while you are there. 9) SIDNEY: Sidney is a small town which was recommended to us by the staff of Butterfly Garden. Only 30 minutes north of Victoria, Sidney is another beautiful harbor town of in this island. Though I couldn’t get out of the car when we arrived Sidney (my little girl fell asleep after a long day), it seemed like a thriving little town with lots of restaurants, shopping venues, and cool local spots to hang out. There is an aquarium located in the Sidney Pier on the waterfront. And I got some good feedback from my family…dorn, missed it. 10) CRAIGDARROCH CASTLE: Victoria’s legendary landmark Craigdarroch Castle was our last place to explore during this tour. It was beautifully adorned for holidays when we visited. After visiting so many castles in Europe, we had to see something that North America had to offer. And it was indeed a place where we loved spending our time in. 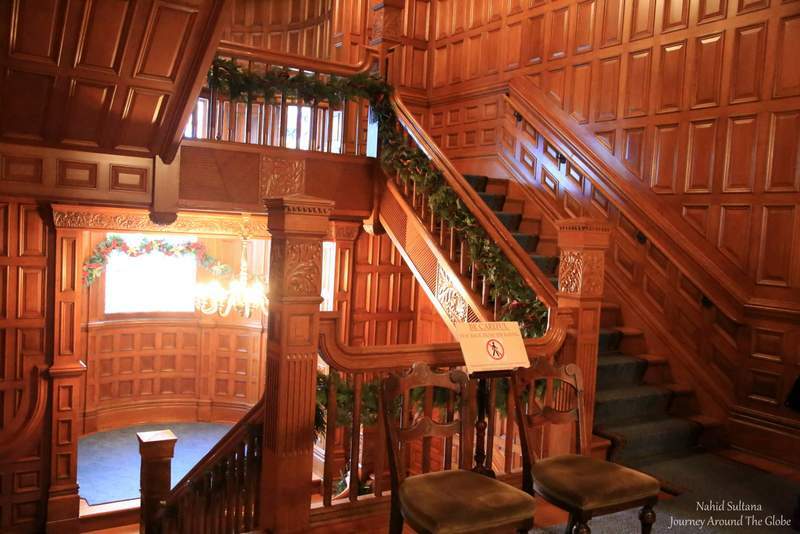 Historically, the castle belonged to B.C.’s wealthiest man, coal Baron Robert Dunsmuir. But unfortunately he passed away before it was completed (in 1890), leaving the entire estate to his wife Joan. Mrs. Dunsmuir lived in the castle until 1908. Today, it’s a museum and a National Historic Site of Canada. The castle reflects their immense wealth and fortune in four floors of exquisite stained glass windows, ornate Victorian style furnishings, and intricate woodwork. 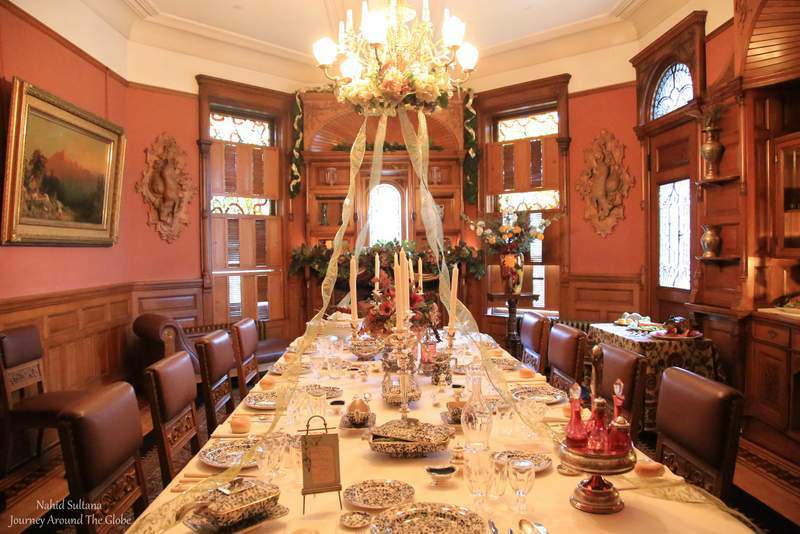 Visitors can see and feel the lifestyle of the very rich from the end of the 19th century in British Columbia. Some noticeable places in this 25,572 sq. ft. castle are the Main Hall, Library, Dining Room, Master Bedroom, Billiard Room, and 17 fireplaces. Experience breathtaking views of Victoria and the Olympic Mountains from high in the Castle’s Tower. It took us about an hour and half to tour the castle. The ticket for each adult is 13.95 Canadian Dollars, and free for kids below 5 years of age. Hi hon, thank you for your lovely blog. I just happened upon it because I was reading The Miniaturist and looking for pictures of the ceiling of the Old Church in Amsterdam. One click led to another and then hey presto! I started browsing your site. I have to tell you, the name of the city is Victoria, but the name of the Island is Vancouver. Victoria CIty, on Vancouver Island. Sigh. I wish I could spend time there. You’ve given me a nice gift with your photos, thank you.